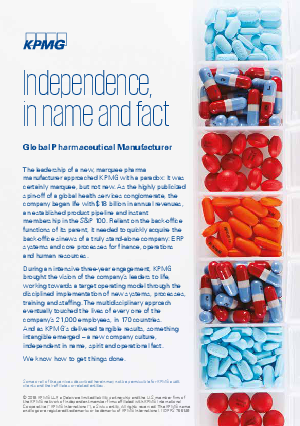 The leadership of a new, marquee pharma manufacturer approached KPMG with a paradox: It was certainly marquee, but not new. As the highly publicized spin-off of a global health services conglomerate, the company began life with $18 billion in annual revenues, an established product pipeline and instant membership in the S&P 100. Reliant on the back office functions of its parent, it needed to quickly acquire the back office sinews of a truly stand-alone company: ERP systems and core processes for finance, operations and human resources. During an intensive three-year engagement, KPMG brought the vision of the company’s leaders to life, working towards a target operating model through the disciplined implementation of new systems, processes, training and staffing. The multidisciplinary approach eventually touched the lives of every one of the company’s 21,000 employees, in 170 countries. And as KPMG’s delivered tangible results, something intangible emerged – a new company culture, independent in name, spirit and operational fact.